The thrill of Roller Speed Skating suits all types of people, whether as cross-training for ice speed skating, for fitness, or for the love of speed on wheels. Regardless of age, speed skaters share a determination to race as fast as they can, blending quickness, stamina, and strategy into a fun, healthy, and rewarding activity. There are four main racing circuits used in roller/ inline speed skating. – ‘Open road‘ either in a big loop or point-to-point racing usually features outdoor and longer (10+ km distances) on streets. – ‘Road‘ track racing on a track from 400 – 1000 metres, in Canada usually on outdoor 400-meter school tracks and at world championships on tracks with an asymmetrical configuration. – ‘Indoor‘ racing on a 100-meter track- usually in a gymnasium or a roller skating facility. A Road Race course can be either an “open” or “closed” circuit. In open circuit road races, start and finish lines do not coincide. Examples would be marathon races that take place from one town to another on municipal roads. A closed circuit road race consists of an asymmetrical closed circuit which competitors cover one or more times, according to the distance of the race. The course must be between 400 and 1000 metres long. Unlike ice speed skating, there are no “lanes” in roller speed races. All races begin with a standing start, and the number of competitors on the line for each race or heat varies, depending on the size of the track and the type of race being skated. Each participant is timed individually, with the fastest time winning the race as his/her front wheels cross the finish line. The key to winning at speed skating is to be smart and fast, and to have a fine skating technique. By controlling the pace on the track, and by taking advantage of any slight hesitation on the part of another, the best skater (often with the aid of teammates) crosses the finish line in the number one position. Some of the important rules that apply above all others include that athletes may be disqualified for blocking, pushing, holding, or hindering in any way the progress of another skater. Relay races also form part of most local, national and international speed competitions. Teams are made up of 2 to 4 skaters, and may be male, female, or mixed. Like ice speed relays, the exchange is completed by one skater pushing the next one from behind. Note: The race program will be the same for men and women, junior and senior categories. Roller speed skating at the International level was traditionally performed on regular roller skates . Since 1990, however, inline skates have totally dominated the medal winners, and they are worn almost exclusively now for outdoor racing, although technically both types of skates are permitted. The inline skates themselves consist of a boot and a fixed frame (wheel assembly). The boots are specially designed to be aero-dynamic and light weight, and the frames may have either 4, 5, or 6 wheels, depending on the size of the skater’s feet. Skates must not exceed 50 cm in length. Stops or brakes are not permitted, as they would add unnecessary weight and create a potential safety hazard. Unlike artistic or hockey skates, the wheels of speed skates extend past the boot in front and out behind for added glide. Rolling Over New Ground: Many great athletes have represented Canada in roller speed skating. John Monroe, Jocelyn Sicotte, and Laurie Lafrance were amongst the first skaters to compete using inline skates at the world roller speed skating championships in Rome, Italy in 1992. From this trio of skaters, Lafrance and Sicotte were the original founders of the Toronto Inline Skating Club- one of the most successful Canadian Roller/ Inline Speed Skating clubs. Road & Ice Connections: Roller Sports Canada has a rich history of athletes joining from ice speed skating (short track and long track) as well as switching from roller to ice speed skating. 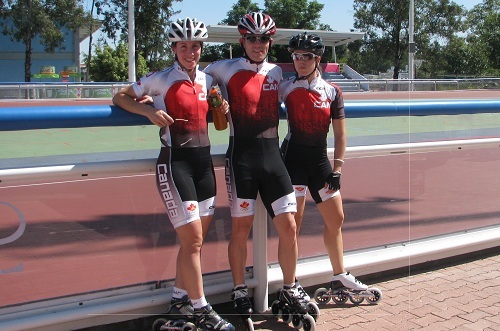 Amongst some of the more well-known skaters to represent Roller Sports Canada and compete in RSC events are 5 time Olympic Medalist long track speed skater Cindy Klassen. She placed top-5 at the 1999 Pan American Games. Short track speed skating team member & world cup medal winner Steve Robillard placed top-5 at the 2000 World Championship in Barrancabermeja, Colombia in the marathon. Short track Olympic Gold Medalist & World Cup medal winner Olivier Jean set Canadian records at the 2006 RSC Nationals in Montreal. Jordan Belchos- who crossed over from roller to ice and placed top-5 at the 2007 and 2008 Long Track Ice Speed Skating World Junior Championships, represented Canada at the 2004 and 2005 world championships and at the 2005 Pan American Championships, winning the Bronze Medal at the 2015 Pan American Games in front of family and friends in Toronto. Arcton (Artie) Lancaster was a member of the long track speed skating team in the mid- 1990’s and he represented Canada at the 1994 world championships and 1995 Pan American Games. Other ice skaters have taken part in RSC & other inline/ roller events, including Francois (Flou) Louis Tremblay, Mike Ireland, Eric Madigan, Frank Hamelin, Jonothan Guilmette, and Mathieu Turcotte. Dominique Larocque (National Capital, Ontario) was Canada’s strongest performer female from 1990 to 1997 and inspired many younger female skaters to push boundaries. A top three finisher in most races she entered in the US, from New York City to Athens to Atlanta, Larocque raced amongst the men in Canada in order to keep up her international status. The highlight of her racing career was winning the 35 km marathon speedkskating event and finishing 2nd in the 100km in Kupio, Finland in 1994. She captured the national speed title in 1997 and decided to retire at that time to focus on the founding of her mountain bike school since she was also on the national mountain bike team in 1991. No other Canadian female athlete has graced the international podium on three disciplines: inline skating, mountain biking and marathon speedskating. A pionneer in all three disciplines, Larocque continues to share her passion with outdoor enthusiasts. Meaghan Buisson (Winnipeg, Manitoba and Saskatoon, Saskatchewan) competed at the 2002, 2003, and 2004 World Championships and at the 2003 Pan American Championship. She won the Lille French Inline Cup/ World Inline Cup race in 2005. She is the first Canadian to win a World Inline Cup race title. In 2006, she set the world record for the women’s solo marathon in Montreal. She was RSC’s first speed female RSC Athlete Rep.
Mike Murray (Brampton/Dundas, Ontario)- nicknamed ‘The Legend‘- represented Canada at the 1994 World Championships and 1999 Pan American Games as an athlete and coached Canada’s team at the 1996 Junior World Championships and the 2007 Pan American Games in Rio de Janeiro, Brazil. Now a father of two, he still finds time to continue competing and coaching. Aaron Arndt (Brampton, Ontario) raced successfully in the USA. He has also lived in Europe while racing on the 2007 World Inline Cup circuit. He won the famed Athens to Atlanta Ultramarathon (138km) in 2007. He competed at the Junior (1996) and Senior (2004) World Championships as well as the Pan American Championships (2005). He is one the few active skaters to have earned an international medal for Canada- a bronze medal in the 500-meter sprint (track) at the 1997 Pan American Championships in Quito, Ecuador. Martine Charbonneau (Greenfield Park, Quebec) has been one of Canada’s strongest performers female in recent years. She competed at the 2005 and 2007 World Championships and the 2007 Pan American Games. Also in 2007, she won the famed New York 100k and set the course record at Athens to Atlanta. Barry Publow (Toronto/ Ottawa, Ontario and Aylmer, Quebec) represented Canada as an athlete at the 1994 World Championships and 1999 Pan American Games in Winnipeg. He coached the 1995 Pan American Games Speed Team in Mar Del Plata, Argentina and the World Team at the 2003 and 2004 World Roller Speed Skating Championships. His contributions to the sport include two publications (Speed On Skates (1999) and The Science Of Speed (2008). Patrick Chayer (Laval, Quebec), one of the first North American skaters to use the double push technique- that was made famous by the all-time great Chad Hedrick. Chayer was first seen using the technique in 1993 and 1994- back then, people called it the ‘Scissor Kick‘ or ‘the Chad‘. Peter Doucet (Mississauga, Ontario)- 7 time World Team member, competed in every RSC nationals since 1994 in Burlington, Ontario and has represented Canada at the 1994 Junior North American Championships in Cambridge, Ontario, the 1997, 2002, and 2005 Pan American Championships and the 2007 Pan American Games. He manages many of the most popular Inline/ Roller Speed Skating websites. Marc Griffin (Cambridge, Ontario) competed in events including the 1994 Junior North American Championships and in the USA at the 1995 X-Games in Philadelphia. Sean Clark (Winnipeg, Manitoba) competed in both speed and roller figure skating at the RSC championships and at the 1997 Pan American Championships in Quito, Ecuador. Beth Clarke (Cambridge, Ontario) represented Canada at the 1998, 2002, and 2003 World Championships and in top USA races. She coached a club in Cambridge (Cambridge Inline Skating School) and helped promote the sport to younger skaters at the local YMCA. Christopher Fiola (Quebec) skated into the record books in the mid 2010’s, setting records in sprint and distance races. Fiola earned top-5 placements at the Pan Am Festival in Mexico and qualified to compete at the 2015 Pan American Games in Toronto. Josée Gagnon (Quebec) represented Canada at the Pan American Games and at the World Championship in the mid-1990’s. Gagnon, who thrived in Canadian marathons, shorted events, and indoor races, represented her club (VRL) and was involved with helping the club succeed. She was among the first Canadian skaters to skate for an a team for outdoor racing (Rollerblade). Other skaters who have competed at the World Championships and/or Pan American Championships and/or Pan American Games include- Sergio Almeralla, Alex D’Mello, Morgane Echardour, Sarah Hopkins, Brian Jalbert, Jesse Pauley, Andrew Hegarty, Sigrid Ziegler, AJ Perrie, Jade Pauley, Chelsea Parry, Tatia Wallace, Dean Arndt, Derik Beier, Tom Hanham, Conny Strub, Eric Gee, Steve Robillard, Mathias Archambault, Christi Peters, Benoit Vaillancourt, Melissa Hemlow, and Josée Gagnon. From Many Nations: RSC has had skaters from other nations compete at the National Championships including Carolyn Gullo (USA), Sergio Almeralla (Mexico), Camilo Echeverri (Colombia), Leonardo Echeverri (Colombia), Morgane Echardour (France), and Suraj Srinivas (India). 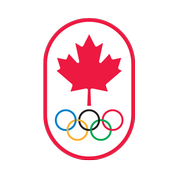 By qualification through the International Olympic Committee Residency Rule, Sergio Almeralla and Morgane Echardour have gone on to represent Canada at the World Championships. Each of these skaters have had a special and important part in helping build RSC’s multi-national mosaic that is reflective of our Canadian society. Promoters, Supporters, and Volunteers: People such as Lenny Porter, Alex Perrie (who currently runs Canada’s only dedicated Roller Speed Skating facilty in Harriston), David Matthews, Tyler Congdon, Wayne Burrett, Jim Mallard, Gilles Bellavance, Eric Gee, Charles Beaudoin, Stephane Charron, Robert Mitchell, Brian Jalbert, Stephane Tremblay, Peter Doucet, Gillian Clarke, Rhona Hughes, Carla (Raetsen) Wilson, Mike Belchos, Regena Rumancic, Conny Strub, John Parry, Rhonda Plante, Pam Perrie and various clubs and groups have all been important not only on the competitive events, but also on the administrative and promotional aspects of Roller Speed Skating in Canada. From VRL Le Club, a skating club based out of Montreal and Laval, Martine Doiron was a relentless worked behind the scenes supporting VRL Le Club and its operations.